There was a lot to love about last year’s Insta360 One. 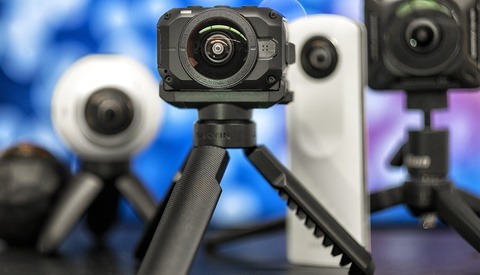 It brought unique features to the 360 party, such as a built-in bullet-time mode, and GoPro/Garmin-like ability to pull out a full HD video clip from 360 and control the viewpoint. Beyond those abilities, it simply was a solid product, with an ingenious “invisible selfie stick” method of stitching that could easily detect and remove selfie sticks from images, a trick that more expensive cameras could not, as well as "FlowState stabilization," which is stabilization for 360 video that just works without any fuss. 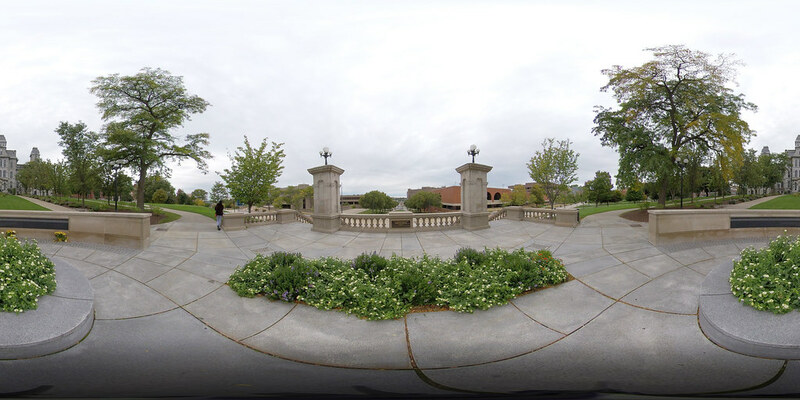 The updated Insta360 ONE X retains all of those features and adds new ones, such as time-shifting, which is basically speed-ramping and new creative frame rates. Many of the new features push the limit of what’s possible on a phone using the Insta360 One app. The whole camera has been given a boost overall. Video resolution jumps to 5.7K at 30 fps (up from the original, which maxed out at 4K), and bullet time resolution gets an increase in resolution to 3,008x1,504 (up from 2,048x512). 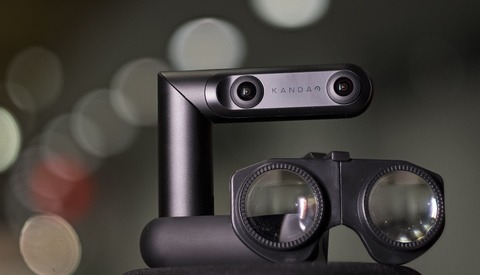 You can also shoot 4K at a faster 50 fps or 3K at 100 fps on the new model. A timelapse mode carries over. A new f/2.0 lens (compared to f/2.2 for the previous model) rounds out the major updates. Some curious changes include lower resolution photos, at 18 megapixels on the new camera versus 24 for the old, but the company says that this helps low-light performance. The camera has a new form-factor, more in line with the Ricoh Theta series than its previous bulbous iteration, and in the process, it loses a way to mount atop an iPhone. It comes with a handy pouch to protect the lenses and a standard tripod mount to attach a variety of accessories, such as the “Invisible Selfie Stick” or a tripod. There’s a spot for a micro SD card next to the tripod mount. If there’re any complaints about the new body, it’s that the pouch is so tight that it’s very easy to accidentally hit one of the buttons and start recording, only to then find out you are out of batteries or memory card space. Insta360 tells me that this was in issue with pre-release firmware, and that the production firmware at the camera's launch will iron out that problem by requiring a long press to turn the camera on. The memory card slot is also recessed just enough to be difficult to access without longer fingernails or another object (I used the tip of an Apple Lightning cable to pop it out). Depending on how you use the camera, the memory card may not be an issue for all-mobile workflows. The microphones on the camera pick up sound and voices surprisingly well for such a small package. The new model has stereo microphones compared to mono on the previous one. There are a generous amount of controls built into the camera and viewable on the LCD screen. You can control resolution and frame rate, set up bullet time, switch photo modes, and access raw and log modes for photo and video. More controls are available from the companion app, of course, but it’s nice to know that you don’t need it. It’s also the way to get the best battery life out of the camera, which is necessary, as it is rated at a slightly lower 60 minutes versus 70 for the old camera (that’s the price of higher resolution video). If you want to try the live video function of the camera, you need the phone for that. One nice feature is that it doesn't require two memory cards like the GoPro Fusion, and under normal usage (i.e., when it doesn't remain on in a pouch without a way to dissipate heat), overheating is a non-issue, even at 5.7K. That's something I can’t say about my Garmin Virb 360, which once ended up in a refrigerator during a shoot just to get the temperature down on a normal shoot. Finally, in a bit of a letdown, there’s no included charger, though there are a variety of cables to plug into a computer or phone. It seems to be a trend for many of these types of cameras to not include a charger anymore. The battery, however, is removable, so carrying a spare is always an option. There is a bullet-time string included, though the idea of spinning around $400 worth of camera and hoping it stays attached scared me enough that I didn't try it. I used the bullet-time handle attached to the selfie stick instead. Image quality is on par with the cameras in its class. 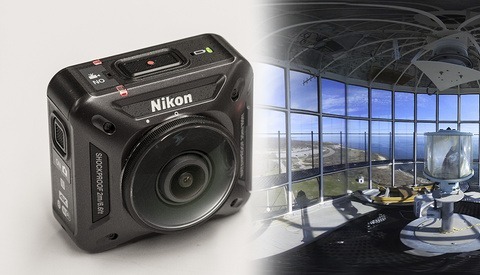 While it was not possible to review 5.7K footage or raw photos at launch because desktop software wasn't ready yet (the company says it should drop on October 12), 4K footage looks much better than older cameras such as the Nikon KeyMission 360 or the Samsung Gear 360 (either model). It’s on par with newer cameras such as the Garmin Virb 360 or the GoPro Fusion. In theory, the 5.7K footage should best the 5.2K of the GoPro, as when you’re stretching an image over a 360 sphere, every little bit helps. While it won’t touch models that use more cameras, in the category of twin-lens 360-degree solutions, this is about as good as it gets. Footage moves smoothly at 30 frames per second, and the stitching is pretty spot on. You have to work hard to get the camera to stitch incorrectly, which is saying a lot. A few neat tricks that separate the Insta360 One X from the competition is its clever removal of selfie-sticks automatically from the image. They're just not there. A few other cameras can do this, but many do not, and none do it as cleanly as this camera. You can even automatically add a nadir patch (to cover the spot where a tripod or other mount would be) right in the app, which saves a bunch of time. 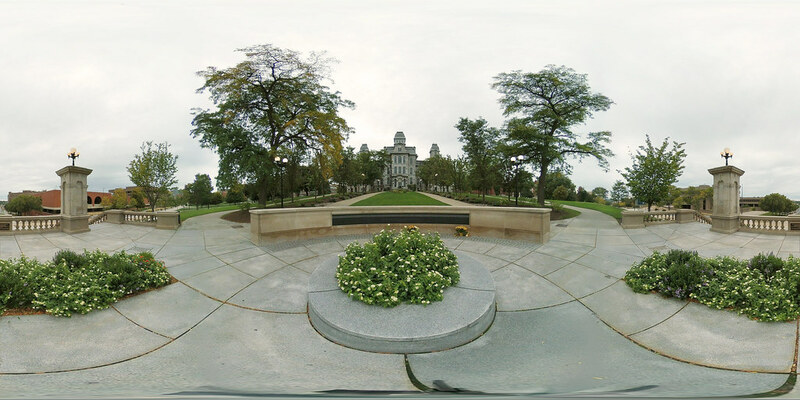 You can see a light shadow added through the app in the photo of Syracuse University above, but you can also add a custom image or an Insta360 One X logo to hide a tripod. Flowstate stabilization, as the company calls it, is no joke. Footage is very stable while walking, and with the ability to control the camera’s point of view after the fact through the app on the phone, this could very easily be the only camera you need for light-duty vlogging. I'd have to give the nod for color (and automatic nadir patching) to the Insta360 One X though. If you’re an adventurous or underwater type, the company also offers a rugged case (the Venture Case) and an underwater housing (the Dive Case) that the company says solves stitching issues that are common when 360 cameras are used underwater. If your workflow begins and ends with a smartphone and you understand the sacrifices in that choice, then this is the camera to buy. You can create and export 360 videos, bullet time sequences, and regular 1080p footage pulled from 360 footage. The app allows for setting all of of your image parameters in video and photo, such as ISO, exposure compensation, white balance, etc. Editing is a breeze, and the app seamlessly connects with the camera every time. It’s refreshing when so many cameras are released with unfinished apps that never reach their full potential until long after the industry has moved on (I’m looking at you, KeyMission 360). Many of the features of the app, such as subject tracking and pivot points that let you control the camera view for a 1080p video pulled from 360, are features that require a desktop computer from competitors. To be able to easily do it in an app is a headline feature of the camera. Like all 360 cameras and their companion apps, though, expect battery life on both devices to drain quickly during the use of all of these functions. It's also easy to max out your phone's storage with 360 video, as I hit the limit several times during testing. However, there’s a big asterisk here about mobile use. Like many other cameras, to release the full capability of the camera (5.7K footage and raw photos, specifically) you have no choice but to use a desktop computer and the company’s Insta360 Studio software. Even if you shoot at 5.7K, the app automatically downscales it to 4K footage. 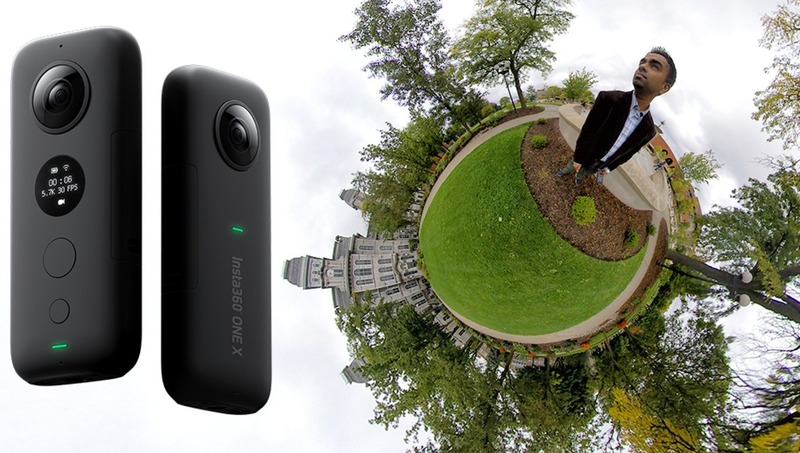 At launch, the desktop software doesn't support the Insta360 One X, and so, if you were hoping to dive right into the highest quality photos and videos, that’s not possible right away. The company promises software to do this on October 12, but there's no way to tell how useful it will be without being able to test it. The files the camera spits out to the micro SD card are proprietary files as well (insp and insv files), and so, you’re not going to be able to do anything with them without the company’s software, which is a bummer. Would it have been so hard to spit out equirectangular JPG files or DNGs that are ready to tone and export without requiring additional software? The app can at least read 5.7K footage, so it's possible to produce high-quality 1080p video pulled from those files; now, if it could only export a full 5.7K file, we'd be all set. That, like many other 360 cameras, is the Achilles heel of this one. While 5.7K 360 video is shouted from the rooftops in marketing materials, and the camera has robust raw photo shooting abilities, it’s a disappointment that most users will likely not be able to access these features without a lot of extra work and special software. If you’re the type that works entirely on your phone, then it may even make more sense to save money purchase the older camera and forgo the higher resolution. If there's ever an update that brings 5.7K 360 video exporting and raw photo editing to the app though, this camera would be just about perfect. For power users and those looking to get 360 footage that’s just a cut above the current 4K camera crowd, it could be worth the extra effort and cost to step up to the Insta360 One X. Easy to use 360 camera, with or without the app. Full featured app means you never really need a computer (unless you need higher resolution or raw images). Great image quality for video with good stabilization. Decent still image quality. Removable battery and memory card. Highest quality video and images can’t be used without proprietary desktop software. Lower-resolution photos compared to previous model and some of the competition. Click the following link to purchase the Insta360 One X.
I bought the first generation Insta360 One a few months ago and have also been disappointed that the image formats are proprietary and the exporting highly limited. I've been working around with a workflow shooting in RAW (actually HDRI) and opening and exporting from the open source UFRaw and then back to JPG/PNG, skipping their InstaStudio viewer entirely. I don't understand why it can't do this because the install weighs a metric tonne (242 MB). C'mon guys...don't even publish a review until you can, well, do a REVIEW. From the article... "While it was not possible to review 5.7K footage or raw photos at launch because desktop software wasn't ready yet"
At the time of launch, this feature wasn't available, but many other features of interest to readers were available, so it's worth getting it out there for folks to read. I've tried out the 5.7K footage since then, and it looks pretty good at this class/price of camera.